SAN FRANCISCO, Calif. — For the very first time, loose diamonds and diamond engagement rings are being sold online with an exclusive see before you decide to purchase option by Diamonds On Web. Now, diamond shoppers will feel nothing but confidence when they decide to buy diamond engagement rings or loose diamonds on the web. Since buying diamonds is such an expensive and important decision, customers might feel wary if they cannot see, touch and inspect the merchandise before they commit to buying it. To solve this problem, DiamondsOnWeb.com has come up with this innovative solution of the consumer not paying until the diamond is in their hands. All the customer has to do is have their credit card authorized and Diamonds On Web will ship the prospective products. The customer then has ten days to make their decision and will not be charged until they approve the purchase. If, for any reason, the shopper is not satisfied, the return shipping will be paid for by Diamonds On Web. Just in time for the holiday season, Diamonds On Web also has some exciting new sales for online shoppers. They are currently offering a 5% discount on all loose diamonds in the $1,000 to $10,000 range when payment is made by bank wire. Furthermore, Diamonds On Web is offering an elite monthly payment plan that gives the customer five months to pay off their diamond. After paying 50% of the total purchase price, the remainder can be financed interest-free for five months. Throughout their 24 years of operation, Diamonds On Web has consistently had a solid reputation as a supplier of diamond products. Once the Internet began growing in popularity, they realized they could pass tremendous savings on to their customers by selling their beautiful diamonds online. Go to www.DiamondsOnWeb.com to read the rave customer reviews and peruse their stunning diamond inventory. 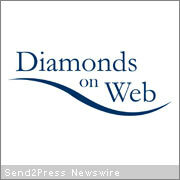 Diamonds On Web, 548 Market St. Suite #21245, San Francisco, California 94104.